HomeNews articles Blog When Does A Bike-Fit Need to be Re-Done? When Does A Bike-Fit Need to be Re-Done? The position we’re in to ride the machine we’re on – if we’ve chosen a road-race bicycle or a time-trial or triathlon frame geometry – is one of ‘power to the pedal’. If ‘power to the pedal’ was to be found in the ‘upright position’ we’d all still be on Penny Farthings, the Tour de France would be replete with hybrids and we’d all be self-sufficient with our shopping baskets acting as portable aid stations. But that’s far from the case. The road-race and triathlon riding positions are rotated forward from upright. And for all cyclists bar the elite, the best riding position is the one that offers best ‘power to the pedal’ in a position that’s sustainable. There was a classic quote during the 2012 Olympics regarding Bradley Wiggins’ cycling position. The retort was “We pay him too much to care whether he’s comfortable or not”! But for the rest of us, the cyclists who have a ‘day job’, we need to both adopt the best cycling position AND be comfortable. So once a bike fit has been done, why would that change? If you’ve gained a lot of weight since your last fit & you no longer feel comfortable then you’d either have to consider reviewing your position, or make the need to re-fit act as motivation to lose the weight! And conversely, if you had excess weight around your torso when you had your fit, and this was a significant factor in the riding position you finally chose and now you’ve lost it because you were subsequently comfortable and have since put 100s of fat-burning miles under your belt, a re-fit would seem appropriate in order to cash in on the opportunity for a better ‘power to the pedal’ riding position. If you’ve picked up an injury (whether bike-related or not) since your last fit which you feel has negatively affected your ride position, then rather than aggravate the injury, work around the problem with a revised bike fit. And by flipping that scenario, we arrive at circumstances close to home. How about the injury that originally forced a fairly upright ride position in order to find comfort … that subsequently healed? 2010, cyclist falls off bike & wraps around concrete sign-post; over period of 6 months loses most of the use of left arm; surgery required to fuse cervical vertebrae 5-7; excellent recovery but left with enduring pain in trapezius muscles; road and tri bike fit 2011 found good positions enabling comfortable riding with minimal neck extension (road – upright position, handlebars level with saddle; tri – long reach & 25mm drop saddle to elbow cups). F.I.S.T. Road Bike Re-Fit, late 2013: surgery 100% successful, trapezius muscles recovered (just like the surgeon said they would! ); through a series of comparisons, cyclist found not just comfort, but instant ‘power to the pedal’ of the variety Dan Empfield said was “nothing short of incredulous”, with a 65mm saddle-handlebar drop. That’s 10% of her seat height, and 65mm more than she originally chose 24 months earlier and 12 months post-surgery. 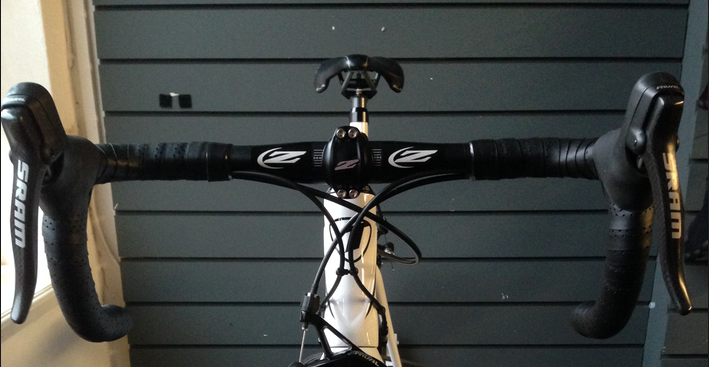 From a ‘flat-topped’ Cervelo R3 size 54 (to get the height), to a ‘road-racy’ Time ZXRS size XS (to get the height!). From riding one day … to racing the next.